Perfect for Limited Space Applications! 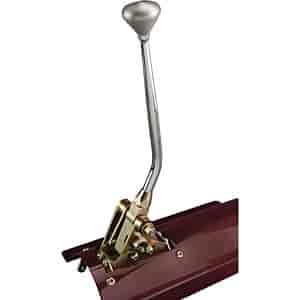 The Floor Mount Automatic Transmission Shifter follows in the footsteps of its parent transmission mount and tailmount shifters, having been designed with the same superior craftsmanship. The exclusive floor mount brackets allow for installation above or below the floor on the transmission tunnel, this is especially helpful when mounting through an existing console. Kit includes splined shift arm with three optional offset arms for mounting to right or left. Removal of the transmission is not necessary for shifter installation. Includes: neutral safety switch, positive lockout in park and neutral, gold iridited bracketry, and all hardware for installation. Tech Note: Shifter lever lengths start above the 3-1/2'' high shifter mount. Use this measurement to determine the desired shifter length for your vehicle. Exclusive mounting brackets allow for above or below floor mount versatility. FMS6727CM is rated 5.0 out of 5 by 1. Rated 5 out of 5 by tarmijo100 from Grat shifter I looked for a few days for this shifter and saw that Jegs offered it for let than the competition and since Jegs offers a guarantee i ordered it, shipped quick and delivered earlier than expected.